A list evidently and successfully produced with an eye towards diversity. That's the list provided to New York's Governor Andrew Cuomo last month by the state's Commission on Judicial Nomination. 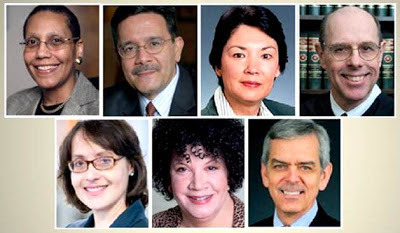 Under New York's system for selecting Judges for its highest court, the Court of Appeals, the Commission produces a list of possible nominees. The governor must then choose from that list in making an appointment. Top row (l to r): Sheila Abdus-Salaam, Rolando Acosta, Kathy Chin, Eugene Fahey. Second row: Jenny Rivera, Margarita Rosa, David Schulz. This is the list from which Cuomo must fill the vacancy created by Judge Carmen Beauchamp Ciparick's retirement. [Because I've already commented on the list and the nomination process quite a bit on broadcast and print media--The New York Law Journal: Fred Dicker: Live from the State Capitol; Public Radio with Karen DeWitt; etc.--much of this may be repetitive to those who have read or heard that commentary. Judge Ciparick was mandatorily retired under New York's law--moronic in my view--that terminates a Judge's tenure on the state's highest Court the year the Judge turns 70. Among other things, Ciparick was the 1st and only Hispanic in the Court's history. [More about her in a forthcoming post.] It is widely presumed--but who really knows--that Cuomo will fill the vacancy created by her retirement with another Hispanic. The list the Commission sent Cuomo gives him 3 such possibilities. Rolando T. Acosta, a Dominican-American who earned both his undergraduate and law degrees from Columbia University, is a judge ("Justice") on New York's mid-level appeals court in Manhattan (i.e., the Appellate Division, First Department). Jenny Rivera, whose heritage is Puerto Rican, is a graduate of Princeton University and New York University School of Law, and has an LLM. from Columbia. She is a professor at the City University of New York School of Law. Margarita Rosa, whose heritage is also Puerto Rican, is a graduate of Princeton University and Harvard Law School, and a former Commissioner of the NYS Division of Human Rights. She is the Executive Director of Grand Street Settlement, a community service agency in New York City. As the foregoing brief outlines certainly suggest, the names on the Commission's list represent not only diversity, but impressive credentials of education and career experience. The same is true for the remaining 4 individuals on the list. Sheila Abdus-Salaam--Barnard College and Columbia Law; Justice on the Appellate Division, First Department. Kathy H. Chin--Princeton University and Columbia Law [Yes, lots of Columbia on the list. ]; partner at New York City's Cadwalader law firm. Eugene M. Fahey--SUNY Buffalo undergraduate, law, and M.A. in European History; Justice on the Appellate Division, Fourth Department (Rochester). David A. Schulz--Knox College, Yale Law, and M.A. in economics from Yale; noted First Amendment litigator and founding partner at New York City's Levin Sullivan Koch & Schulz. The Commission's current Chair is former New York Chief Judge Judith Kaye. Among her staff are Counsel to the Commission, Steven Younger, whose illustrious career began with a clerkship for Court of Appeals Judge Hugh Jones, and Deputy Counsel John Halloran, whose own began with clerking for Court of Appeals Judge Matthew Jasen. In my view, they have produced a very strong and varied list. Governor Cuomo has much to choose from. Without hedging on that assessment or diluting it in any way, let me add this one observation. If there is a complaint that might be registered, and I'm confident it will be if it hasn't already, it is that every individual on the list is a Democrat. No, no Republicans. Beyond that, most if not all the individuals on the list seem clearly to be political liberals. Their career backgrounds would certainly suggest that. E.g., Brooklyn Legal Services; Harlem Legal Services; NYC Commission on Human Rights; Appointments by former Governor Mario Cuomo, former Chief Judge Kaye, and current Chief Judge Jonathan Lippman; Puerto Rican Legal Defense Fund; Civil Rights Bureau of the NY Attorney General's Office; NYS Division of Human Rights; Grand Street Settlement. Of course, it might be argued that Democratic Governor Andrew Cuomo would surely want to choose a Democrat. That in replacing Judge Ciparick, who compiled an unmistakably liberal voting record on the Court, Cuomo would surely want to choose a liberal. That with 4 Judges of the 7-Judge Court currently being Republican, appointed by former Republican Governor George Pataki, and being fairly to firmly conservative, Cuomo would surely not want to strengthen the Republican or conservative majority by appointing a non-Democrat or non-liberal. So why bother with putting anyone but Democrats and liberals on the list? But who really knows about what Cuomo would do? Indeed, the first Governor Cuomo appointed as many Republicans as Democrats. As many conservatives as liberals. Yes, Mario Cuomo's primary concern seemed to be to remedy the Court's lack of diversity. He appointed the first woman, the first African-American, and the first Hispanic. But the senior Cuomo's 10 appointments to the Court, over the course of his 12 year tenure as Governor, were a politically and ideologically mixed group. It would not be frivolous or merely partisan to suggest that Governor Andrew Cuomo should be given the opportunity to be as bi-partisan and bi-ideological as his father was in making Court appointments. It is fair to hope--and indeed I would expect--that the Commission's future lists will be more politically and ideologically diverse. It may well be that the Commission had to contend with a dearth of Republicans and conservatives in the applicant pool. I don't know. But it's clear that the Commission's outreach was so successful in insuring other aspects of diversity, that the Commission is likely to be pretty successful with efforts for political and ideological diversity as well. As strong as this current list is, and I do think the Commission produced a superb list, it could be even stronger, and even more diverse, with Republicans as well as Democrats, conservatives as well as liberals--even independents and "centrists." In any event, we now await Andrew Cuomo's pick, and then the Senate confirmation proceedings. [Additional commentary by yours truly, on broadcast and print media, can be accessed directly at the links below and is also available on a separate post on this blog accessible here: The List to Replace Ciparick (addendum)--media commentary. New York Law Journal: John Caher and Joel Stashenko, "Experts Point to Experience, Diversity of Candidates on List," at http://www.newyorklawjournal.com/PubArticleNY.jsp?id=1202580146673&Experts_Point_to_Experience_Diversity_of_Candidates_on_List. Fred Dicker, Live From the State Capitol. Interview available at http://www.talk1300.com/CMT/podcast/FREDPODCASTDEC172012.mp3, --from the 29:15 minute:second mark. Karen DeWitt on North Country Public Radio: "Cuomo Has Chance to Remake State's Highest Court." Interview available at http://www.northcountrypublicradio.org/news/story/20291/20120813/cuomo-has-chance-to-remake-ny-s-highest-court. New York Post: Erik Kriss, "Andy can court all new judges," at http://www.nypost.com/p/news/local/andy_can_court_all_new_judges_xw90vlV02HnxmV0jt9YdxO. Capital: Dan Rivoli, "How Andrew Cuomo can recast the state's highest court," at http://www.capitalnewyork.com/article/politics/2013/01/6795934/how-andrew-cuomo-can-recast-states-highest-court. Again, they are all available or accessible at The List to Replace Ciparick (addendum)--media commentary.